How many times have you had someone suggest that you should spend your money to buy a better gun, part, or reloading component, or use a top-notch gunsmith, because it will increase the accuracy of your equipment? Or the reverse, where someone suggests spending your money on practice ammo or training aids, because that will improve your scores more than spending money to accurize your gun? I think it's pretty clear to everyone that, in competition, more accurate equipment leads to better scores. But how much better? I mean, would you pay $1000 to increase your score by 8 points in a bullseye 2700 match? How about $1000 to increase your score by 250 points? Those thoughts are nice, but most people talk about accuracy improvement in inches, not points. How many points will a 1" increase in accuracy get you? You need to know that before you can determine whether an expenditure on a 1" increase in accuracy is worth it. But I've never talked to anyone, or seen any post on any forum that really answers that question. If you think about it for a few minutes, you'll realize that's because it is not an easy question to answer. It depends on which target you are using (because they have different-sized rings), and where on the target you are aiming (because the rings on a given target are different widths), and it even depends on what caliber of bullet you are using. That's a lot of variability. So, being a computer programmer, I wrote a program that performs the necessary calculations. The results show points lost (or gained) by various levels of inaccuracy for each target with each caliber described in the NRA rulebook. The results also show points lost over 10 shots on each target, and even 90-shot sets (3 slow, 3 timed, 3 rapid, at various distances), again for each caliber. Which ends up being rather a lot of data. That page also contains information about how to make use the results, and how the program works. Writing the program was partially inspired by this thread .45 bullseye pistol 1.5 guarantee, particularly one of the posts by mspingeld (and subsequent discussion) about the difference in scores between a 3" gun and a 1.5" gun for a shot at the edge of the 10 ring on a 50yd target (B-6) with a 45. I believe I have an actual answer to the question... the 1.5" gun is about half a point better than the 3" gun for that particular shot (which is a pretty significant difference, if you think about that kind of improvement over the course of an entire match).. In addition to answering such hypothetical questions, the results are useful in evaluating many issues in bullseye shooting, such as whether it's worth it to buy and use new brass (see my post in this thread: Testing ammo groupings in a stock Range Officer at 25 yards), and many others. Let me know if you have any questions about the program, the results, or how to make use of the results. Here is another approach, most 22's are sub 1 1/2-2" @ 50yds, so if your 22 scores are in the low to mid 800's it's time to start looking for a 45 that can shoot 1 1/2-2" groups. If you are in the mid 800's (855 is Master) then you obviously are doing well on the fundamentals. Don't count on your 45 scores to jump right up there though. I applaud your effort to attempt to show points lost due to inaccuracy, but it doesn't account for skill, ability to execute a precise shot or fatigue. Trigger control is primary difference between shooter classifications, not the equipment. I've shot my own pistols, customers pistols and loaner pistols over the years at matches. I shoot close to the same scores/average all the time. I use good brass for some matches and old brass that has close to 10 or more reloadings and my scores are consistently the same. Poor trigger control, poor hold, or any other weakness in the fundamentals contributes more to a shot not being in the 10 ring than the accuracy or caliber of the pistol. I see shooters buy better equipment all the time, but their scores seldom rise consistently unless that shooter is growing and developing into a better shooter anyways. Your program is based on good trigger squeeze with no outside forces. Bad shot starts at the trigger finger and grows as it gets to the muzzle; radial velocity. So I see a ton of effort that in my opinion doesn't change or influence my thoughts on the BE game. Learning how to pull a trigger does more for scores than anyone thing. And yes at some point you need good equipment. Most .22 pistols will easily hold X ring at 50 yds. Look at the scores being shot! Not stellar for majority of shooters. Less recoil, very accurate and forgiving to shoot. Scores will be close to the same even if it shot 1/2" groups. Trigger control! I watch shooters spend more time on stuff that doesn't improve their shooting instead of really dry firing and doing something with the biggest gains. A great trigger is more important than an 1.5" pistol. I'd take a 3" gun with a great trigger over a 1.5" gun with horrible trigger. My trigger is my friend. It let's me know whether I should shoot or abort the shot. It lets me know the pistol is about to fire.......it is my feedback for executing a shot. Also 3" pistols don't shoot all shots at extreme limits of group. It will have clusters with flyers. That's why I like the RO for an entry level pistol that can be built into outstanding pistol down the road. So I don't believe in gimmicks or easy ways to become a better shooter. I believe in mastering marksmanship fundamentals and applying them. It's never been done successfully any other way. I do believe in using results to aid in improvement, but they will predominately come off the firing line. Dry firing trains you and live fire reinforces the dry firing. Like I was told when I began shooting BE many years ago; "you gotta be knee deep in brass". During a ransom rest session a guy watching us asked if we would test his 45 that in his words couldn't hit the side of a barn. Turns out it was a 2" gun at 50yds off the rest, but off hand we were lucky if we put more than one in the black due to the crap trigger. Don't get me wrong......I love accuracy! I appreciate your attempt to put gun and shooter accuracy in perspective. I too, have tried to do some calculations myself and thus was interested in your work. I did go to your website and review briefly your assumptions and math, and will briefly comment. Please forgive me if I got them wrong or misinterpreted them. Briefly, shot distribution and the sum of hold (everything related to breaking the shot) can likely be described by a normal distributions (but that must be proven). Thus means and SD's must be estimated or determined, and can be added. An important point is that more hits are in the center, than not (think Bell Curve). You assumed distribution is "random". It is not. Thus more shots will be closer to center than not. Statistically, "outies" may actually be "innies" thus the need to add variation in an appropriate statistical fashion. Now having said that, the hold variation for an expert is much larger than that for a high master, and there must be separate calculations for each as to the value added of a more accurate gun. Now, taking all of that into consideration makes my head hurt and I never went further with calcs., but that doesn't prevent some important conclusions, several of which have already been noted by others. Since the sum of all aspects to breaking the shot are the largest variable, the difference between a 1.5" gun and a 3" gun (at 50yd) is negligible for score for most of us. At 25 yds, even less. It is usually the archer and not the arrow. I really appreciate your thinking of this issue, and attempting to quantify an important consideration for many or us, that is, how much gun do I really need as a beginner and how accurate must my ammo be to take me to the next level in our sport? It is an individual choice as to where we must place our efforts. Thanks for your thoughts and keep up the good work! Hershel was choosing from 3 Lamborghini's, and chose the best driver's seat..,. To me the issue is if the shot is on call. With a "2 inch" gun the shot would be perceived as on call. Bigger than that perhaps not. That's why you buy an accurate gun. The shooter may or may not be precise in their shot placement, but the gun put the bullet where it was pointed. @bdas, Glad I inspired you! I too like math and the analysis. Playing both sides of the fence, I also agree that a loose gun in the hands of a high master will get great results. It seems to be undisputed that mastering the fundamentals, particularly through dry firing, will yield the most bang for the buck (bad pun). I have a Pardini and an Accuracy X which came with a 1.2" test target. I'm still an expert but improving, mainly through dry firing. I find another valuable aspect in my journey is the self analysis in the car on the way home from a match. What went well? What do I need to focus on? Often I can't identify the issues during the match but I can on the way home or soon after. Then I write it down and review the notes before the next range visit or match. But...psychologically, knowing I have the equipment that can do the job removes that variable from my mind and that has value to me. With reasonable maintenance, I don't have alibis and any shot that's not a 10 is clearly on me. Which fundamental broke down? I never feel that my equipment didn't do what I asked it to do. Bottom line: Buy decent equipment within your budget, dry fire, practice, shoot matches, analyze. If the obsession lasts and your budget allows, upgrade, but do it with the understanding that although better equipment may buy some points, more focus on the fundamentals will yield more. Last note-Along with a bunch of brand stickers on my gun box is a sticker of a happy face. It's there for a serious reason. Sometimes, due to the desire to improve and the frustration when things don't go as hoped, the sticker is a reminder to smile. It reminds me to balance my ambition of achieving the rank of high master with the reason I do this...it's great fun! Jon Eulette wrote: I applaud your effort to attempt to show points lost due to inaccuracy, but it doesn't account for skill, ability to execute a precise shot or fatigue. Trigger control is primary difference between shooter classifications, not the equipment. I've shot my own pistols, customers pistols and loaner pistols over the years at matches. I shoot close to the same scores/average all the time. I use good brass for some matches and old brass that has close to 10 or more reloadings and my scores are consistently the same. Poor trigger control, poor hold, or any other weakness in the fundamentals contributes more to a shot not being in the 10 ring than the accuracy or caliber of the pistol. I see shooters buy better equipment all the time, but their scores seldom rise consistently unless that shooter is growing and developing into a better shooter anyways. Your program is based on good trigger squeeze with no outside forces. Bad shot starts at the trigger finger and grows as it gets to the muzzle; radial velocity. So I see a ton of effort that in my opinion doesn't change or influence my thoughts on the BE game. Learning how to pull a trigger does more for scores than anyone thing. And yes at some point you need good equipment. Most .22 pistols will easily hold X ring at 50 yds. Look at the scores being shot! Not stellar for majority of shooters. Less recoil, very accurate and forgiving to shoot. Scores will be close to the same even if it shot 1/2" groups. Trigger control! I watch shooters spend more time on stuff that doesn't improve their shooting instead of really dry firing and doing something with the biggest gains. A great trigger is more important than an 1.5" pistol. I'd take a 3" gun with a great trigger over a 1.5" gun with horrible trigger. My trigger is my friend. It let's me know whether I should shoot or abort the shot. It lets me know the pistol is about to fire.......it is my feedback for executing a shot. Also 3" pistols don't shoot all shots at extreme limits of group. It will have clusters with flyers. That's why I like the RO for an entry level pistol that can be built into outstanding pistol down the road. So I don't believe in gimmicks or easy ways to become a better shooter. I believe in mastering marksmanship fundamentals and applying them. It's never been done successfully any other way. I do believe in using results to aid in improvement, but they will predominately come off the firing line. Dry firing trains you and live fire reinforces the dry firing. Like I was told when I began shooting BE many years ago; "you gotta be knee deep in brass". I agree with most of what you said. However, I do think that you are slightly mis-interpreting what the results are showing. First, the program does not attempt to make any distinction between how much of the inaccuracy is due to the shooter, versus how much of the inaccuracy is due to the equipment. You COULD think of it as "the point of aim was at the center of the 9-ring before the trigger finger started moving, and then the shooter introduced at 2" deviation, and the equipment introduced an additional 1" of deviation (3" radius), so the points lost to that inaccuracy will be shown by the 6" column". On the other hand, you COULD think of it as "the POA is where the sights are pointed when the shto breaks, and the inaccuracy is what the gun + ammo is contributing". The results aren't one way or the other. Second, the results clearly show that even small increases in shooter skill have a much larger impact on your scores than accuracy improvements. For example, if you look at the 45 caliber score-of-bullet page, at the 90-shot aggregate at 50yd/25yd... if your POAs suggest low expert scores (90 per target, or 810 for 90 shots), then with a 3" gun your score will be 802.52. Spending a bunch of money on a 1" gun improves your score to 809.11, a 6.59 point improvement. But if you work on your fundamentals and improve your POAs such that they suggest scores of 92 per target, then your same 3" gun will give you a score of 820.54, an 18.02 point improvement. That very much supports your assertion that you don't see huge score differences when you shoot different equipment, but you do see significant score improvements from working on fundamentals. Third, I think the primary value of the results is comparative and general, rather than absolute. In the example of new brass, the point is that, if using new brass yields about a 1" accuracy improvement, you can compare the results for new brass with the results for old brass (with or without also adding the inaccuracy introduced by the shooter), and get at least a general idea of how much it helps you. I think it's instructive to know that it would probably only increase my score around 8 - 10 points (I shoot around sharpshooter scores with my 45 now), so I can make a reasoned, informed decision about whether it's worth it for me to buy all-new brass, versus reloading what I have. I also think it's instructive to see that, as you get better, the improvement increases, so you can understand why really good shooters care about such details (plus it's obviously much more difficult to increase your skills from 95 to 97 than to increase from 85 to 87, so equipment improvements are more attractive for better shooters). All that being said, I think one of the other things that the results show is that you truly can buy points. For a mediocre shooter, more accurate equipment will result in better scores. For good shooters, more accurate equipment will result in better scores (and the improvement amount is generally bigger for better shooters). Whether the improvement in score is worth the money for the equipment is up to you and your situation, but at least the program results give you a solid data point to help make an informed decision. I absolutely agree with your assertion that it's a shortcoming of the program that it assumes a completely random distribution of the point-of-impact within the circle of inaccuracy. I seriously considered altering the weighting calculation to account for exactly what you're thinking... that many contributors to inaccuracy (such as the shooter's wobble area) will, statistically, be more likely to put shots in the middle of the circle, rather than at the fringes. However, it turns out that in almost all cases, such a change to the weighting calculation doesn't make a big difference in the calculated score. Why? Primarily because (a) the ring or rings nearest the point-of-aim already dominate the weighted score, and (b) such a change reduces the effect of both extreme point gains and extreme point losses, which end up balancing each other. Making the rings near the POA dominate the weighted score a bit more, simply doesn't change the weighted score very much. Keep in mind that, although the results are carefully calculated without any rounding ('cause I'm a scientist type), and shown to 2 decimal places in the results tables, the real value is much more generalized than that. The value of the program is to tell you that (for example) a 1" increase in accuracy might yield, say, an 11-13 point improvement over the course of the 90 shots with that gun in a match. If the "true" improvement (if more variables were accounted for in the program) is really 9 points or really 15 points is not super-critical in my mind. The value of the program is knowing that it's not a 2 point improvement, and it's not an 80 point improvement. Getting an order-of-magnitude understanding of the level of improvement is (in my mind) helpful. As I mentioned in my response to Jon, I think the results absolutely support the assertion that, unless taken to extremes, improvements in shooter skill will improve scores much more than more accurate equipment will (which is a valuable conclusion in and of itself). But sometimes that improvement in skill is easier to say than do. The practice / training effort for a marksman to improve from a 73 average to a 76 average is usually not that great. In that situation, it's pretty easy to advise practice / training versus spending $1500 on better equipment to get such a 3-point improvement. But, I think we can all agree that the practice / training effort to improve from a 93 average to a 96 average is very significant. If (and I'm not saying that it could, but IF) spending $1500 on better equipment could buy you THAT 3-point improvement, I think quite a few experts would gladly spend the money. So, it's my opinion that it very much depends on your situation. Thank you for looking at what I did, and giving well-considered feedback. I'm open to criticism and certainly agree with some of yours. Thanks for your response. I think we both agree that a pistol of higher precision (shoots smaller groups) will yield higher scores. The question is, how much? If you are interested in shot distributions, precision and accuracy, you might review a thread at Rimfire Accuracy "Fun with probabilities". It provides a competent analysis of thousands of shots from 22LR rifles. Benchresters are really into this stuff! You may not be able to shoot as good as your gun but you are never going to shoot better then your gun. I got frustrated trying to learn this sport using my Series 70 Gold Cup NM. I figured this was a good gun for the price i paid for it used and all I needed to learn the sport. I just was getting terrible groups then I bought a Ransom Rest. The gun was shooting 5" at 50yds. I fitted a new barrel bushing and that brougnt it down to 3.5". I now shoot a Les Baer WC. It is only their 2 1/2" gun but the test group was 1.6" and I have Ransomed it at 1.8". I am never going to shoot this good at 50yards but know it is possible. Magload wrote: You may not be able to shoot as good as your gun but you are never going to shoot better then your gun. I got frustrated trying to learn this sport using my Series 70 Gold Cup NM. I figured this was a good gun for the price i paid for it used and all I needed to learn the sport. I just was getting terrible groups then I bought a Ransom Rest. The gun was shooting 5" at 50yds. I fitted a new barrel bushing and that brougnt it down to 3.5". I now shoot a Les Baer WC. It is only their 2 1/2" gun but the test group was 1.6" and I have Ransomed it at 1.8". I am never going to shoot this good at 50yards but know it is possible. Magload, that is similar to my situation. I bought a Springfield Range Officer, and shot it for nearly a year, but I was getting frustrated with it. My 22 scores are regularly expert-level now, but my 45 scores were bad marksman stuff (average was in the mid-to-upper 70s, or worse if I had a bad day with rapid fire). I did some informal ammo testing from a sandbag with various reloads, but they were all making around 3" to 5" groups at 25 yards. One of the guys I shoot with pointed out that those sandbagged groups looked an awful lot like my slow fire groups. Talk about frustrating. No wonder my scores were so bad. A sandbag isn't a Ransom Rest, but that told me it was time to get my RO accurized. I started writing the program right around the time I sent the RO out to Dave Salyer for a slide mount, trigger job, and Kart NM barrel & bushing. Part of my motivation for writing the program was to get some idea of what kind of points improvement I should expect from the gun when I got it back. It's hard to differentiate between the improvements due to the dot (versus iron sights), the improvements due to the trigger job (very much improved), and the improvements due to the Kart barrel. But there is no mistaking the improvement. I haven't shot it in a match since the changes, but just last week at our informal league night, I shot a 90 SF, 98 TF, 87 RF for 275/300 (91.6%) with it, which I think is my personal best with a 45. While testing sight adjustments at different distances the other day, I put all shots in the 10 or X off a sandbag at 25 yards (with my reloads), which suggests it's at least a 1.5" gun at 25 yards now (and would undoubtedly be even better from a machine rest). The program results suggest that, if my POAs are around low-expert level (which my 22 scores suggest), going from a 5" gun @ 25 yards to a 1.5" gun @ 25 yards should gain me about 17.6 points in a 1-slow, 1-timed, 1-rapid course of fire. Going from a 3" gun to a 1.5" gun in the same scenario should gain me about 5.8 points. What I'm actually seeing so far is about a 13 - 15 point improvement. That suggests to me that the program results are at least roughly similar to reality. As you allude to, and as mspingeld and others describe above, it's hard to put a total value on accuracy, though, because it's not only about points scored. My shots are mostly on-call now, which is incredibly valuable as a training tool. When I try something new, I know that the results closely reflect what I did, and not just luck (good or bad) due to the inaccuracies of the gun/ammo. And it's hard to put a value on having confidence in your equipment. P.S. It has not escaped my notice that what dronning said in the very first response in this thread also closely matches my experience. Once my 22 scores got into the low-to-mid 800's, I found I needed a more accurate 45. There is an amazing quantity and quality of knowledge in this forum. First, for those who like statistics and attempting to put a "number" on a gun's performance, in addition to calculating the points, it would be interesting to see the change in CEP. Here's one article that explains it, and how to do the calculation. My other thought is that while it's more important to shoot well than to buy the best equipment, why not do both? I'm pretty sure that a "good shooter" with an "average gun" will shoot far better than an "average shooter" with even "the best" gun. But even if you're an average shooter, if you are serious about all this, why not buy a "better" gun? Well, for what I'm measuring, it doesn't really matter whether you measure accuracy as group size, or CEP; it changes the values in the column headers, but not the data. I'm not against using the CEP as the measure of accuracy, but since most shooters and gun manufactures and gunsmiths use group size, I thought it made more sense to do the calculations using group size. As for "why not buy a better gun?"... That's the whole point of my effort. Trying to decide when it's worth it to invest in accuracy is not obvious to the new or novice shooter (and based on what I've read, it's not obvious to some veteran shooters, either). Getting an understanding of how many points you're buying helps to put things in perspective. How can you decide whether to invest in accuracy (whether investing time or money), if you don't know how much difference it will make in your scores? The program taught me that (for my skill level), moving from a 4-5" gun to a 1.5" gun (at 25yds) would be very noticeable (and it is). But additional increases in accuracy will be almost unnoticeable until I can shoot around master level. And that's good to know, because, having seen the increase in scores from having my 45 accurized, I could easily have been fooled by my experience into thinking that further expenditures on accuracy would yield similar improvements. But they won't. And that's worth knowing. Conversely, I'd love to have a Pardini 22. But it's simply not worth it to me. I'm not suggesting that a Pardini is a bad gun, or a waste of money. But, for me, at my current skill level, the difference between the accuracy of my Buckmark, and the accuracy of a Pardini is only going to buy me a handful of points in a match, so it's not worth $3000 to me. And that's good to know. And that's REALLY the point. Instead of guessing or wondering or basing my decision on anecdotal evidence, now I know. I posted the results, because I thought other people might want to know, too. Well, I apologize if that seemed flippant, and for not providing an important initial clarification, that is, what my definition is for a "3 inch gun"? How many times have we heard someone say "My gun will shoot x inches all day if I do my part". So what does that really require? I looked back to my data, and pulled a representative sheet for my SW41, fired from a Ransom Rest on a reasonable day, with a mix of ammo (SK Stnd., Wolf Match and Extra); 10 shot groups (because that is what I have to put on a target), having fired 5 of them. 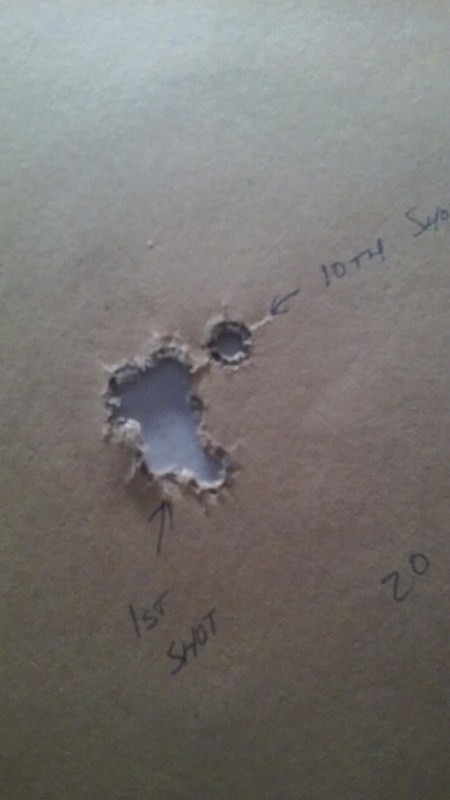 The gun averaged 1.2" C-C, SD 0.18 (n = 5). The composite group had a max C-C spread of 1.70" (n=50), which is pretty close to mean+2SD. I feel pretty safe calling that a 1.7" gun with 95% confidence. I shoot that in matches. So what about the 3" gun? Comparable numbers, assuming similar dispersion, are 2.2" C-C, SD 0.28, which would yield a 3" group "all day", or rather, with 95% confidence. Many of our esteemed gunsmiths are capable of such a gun or even better. Certainly the more accurate the gun, the better we will shoot. Nevertheless, I think many of us would be satisfied to own such a gun/ammo combo. The program taught me that (for my skill level), moving from a 4-5" gun to a 1.5" gun (at 25yds) would be very noticeable (and it is). The former would shoot 8-10+" at 50 yds., and the latter, as above. I agree the former would prove to be extremely frustrating. However, I still stand by the conclusion I stated above, and I hope the explanation I provided has helped to clarify my comment. It's worth it when you clean your first target and you want to be in the sport to win. I shoot to win, my goals are to spank me some shooters on the line and as I progress I am chasing down classes and working my way through them. Curious - have we, as a group, come up with an accepted definition of "group size"? If so, how many shots are used to determine the size? for a 50yard slow and 25 yard time and rapid. the X ring is 1.695 in 10 ring 3.36 in. so I want a 22lr that shoots 1.75 w/ match ammo, and a 45 that will shoot 2" w/ match ammo. I can call X ring shots @ 50 and 25. when they are 9s or worse it was me not the gun. Actually a gun that shoots 4-5" at 25 yds will shoot much worse than 8-10" at 50 yds. That's why 25 yd testing is not very useful. Also, a few years ago at Camp Perry I asked the AMU armorers how they test. They said, for their top shooters, they need a 1.5" group for 30 shots at 50 yds. sharkdoctor, I didn't think it was flippant at all. I completely agree that you'd have to be a very good shooter to see a noticeable difference between a 1.5" gun and a 3" gun at 50yd. (For a 90-shot match at 50/25 yds, a marksman (~68-78) would gain 2-4 points, a sharpshooter around 1-2 points, an expert around 5-6 points, a master around 6-8 points, and a high master 5-8 points.) So, unless you're an expert or above, it will be completely unnoticeable, and even then it's a fairly modest improvement (less than 1 point per target). So once you're using equipment that's in that range of accuracy, the vast majority of the time, as you said, it *IS* the archer, and not the arrow. P.S. One of the most interesting things I've learned from this exercise is that the numbers back up what a lot of the experienced shooters are saying... Namely that you cannot hope to be competitive (even amongst the lower classes), and it's difficult to practice effectively because you cannot distinguish your errors from equipment inaccuracies, unless you have reasonably accurate equipment (let's say around 2.5 - 3" at 25yd or 5 - 6" at 50yd). However, once you do have that "decent" equipment, you should stop worrying about the equipment and focus on your fundamentals if you want to progress. Once you're hovering around high expert / master (93-95), you'll find it worthwhile to invest in truly top-notch equipment, continue to work on the fundamentals, and start considering all those minor details that you've been safely able to ignore up to this point (from subtle differences in reloading components, to more exotic training drills/equipment, to nuances of the mental game, and so on). As a group? Depends on the group. Benchresters shoot 5 shot groups and measure center to center. The military ammunition makers use mean radius and will shoot Ten shots per target using not less than two barrels. They them calculate several numbers, but accuracy requirements are specified in mean radius. Bullseye shooters use center to center of ten shots. Human nature of all non-technical people is such that the best group shot becomes the guns level of accuracy. So if by some fluke your old warhorse shoots a 1 inch group that's what is claimed. I prefer a number of groups fired at least three and five is better. Wobbley wrote: ........I prefer a number of groups fired at least three and five is better. I often use one backing board at the range, and put one target after another in the same place. Sometimes I felt good about the results - until I looked at the backing board from the rear. Sorry for the interruptions - I'll go back to reading and learning.